Capturing the essence of one of the best loved musicals of all time, our My Fair Lady room is truly something special. Famous for its incomparable elegance, glamour and feel-good spirit, the film’s qualities are certainly reflected in this magical hotel room. Sleeping up to six guests, the My Fair Lady room radiates character and charm reflective of the classic musical. 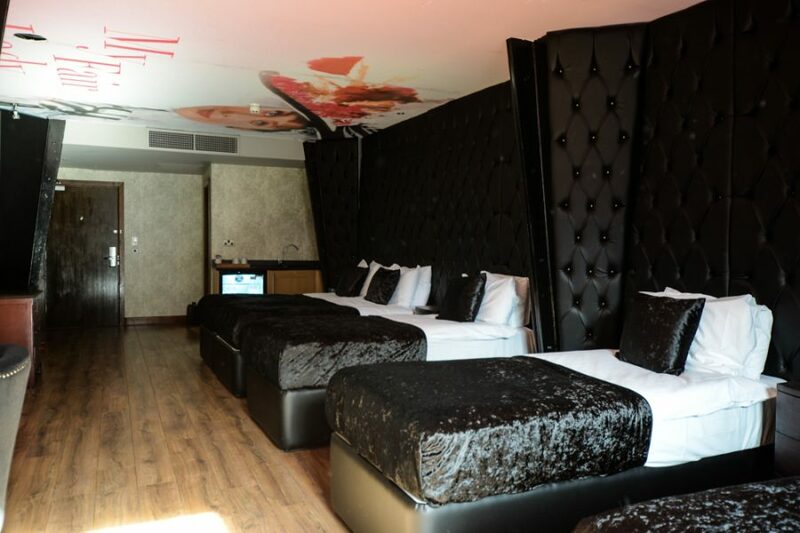 At Arthouse Hotel, we specialise in group accommodation in Liverpool, so you can guarantee a high-quality stay that doesn’t compromise on space, facilities or luxury. For those hoping to see the fascinating sights in Liverpool, we’re located only a short walk from many of the city’s most iconic landmarks. And of course, we’re the ideal choice for experiencing the best of Liverpool’s nightlife. To our guest’s satisfaction, the city’s most vibrant bars and clubs are only moments away, so all you need to worry about is hitting the town in style! My Fair Lady is a 1964 musical film directed by George Cukor. An enchanting blend of comedy, romance and singalong hits, Cukor’s creation is a timeless masterpiece that fans continue to adore today. Visually striking with an infamous score, Cukor’s revival of the stage production brought the dazzling costumes and colourful sets to the big screen. Starring Audrey Hepburn, the film is adapted from the 1956 stage musical, originally starring Julie Andrews. Though the film could have easily missed the mark, there’s no doubt that the magical 1964 adaptation managed to cultivate the story without losing its charm and success. My Fair Lady tells the story of a young girl’s transformation from a working-class Cockney to a high society Victorian lady. Eliza Doolittle (Hepburn) agrees to lessons from phoentics Professor Henry Higgins, who works with Eliza on her speech to improve her job prospects. However, it doesn’t take long for their budding relationship to take a twist. Escalating into a complicated love triangle, Higgins finds himself besotted with Eliza…but only after she’s been swept off her feet by an aristocratic suitor. Filling the shoes of Julie Andrews certainly wasn’t an easy job. Andrews had seen great success following her portrayal of Eliza, and audiences held high expectations for the story’s glamorous film production. Audrey Hepburn had already become a Hollywood great. And while she may have been blessed with a talent for acting, her sweet singing voice could only go so far. Though Hepburn could and did sing parts of the musical hits, it was Marni Nixon’s range that carried the soundtrack. Hepburn’s voice was dubbed with the singing of Nixon, who was not credited in the film. Many assumed that fans at the time weren’t aware of the voice dubbing, yet a 1964 Time Magazine article suggests otherwise. The article reveals the truth about Eliza’s enchanting voice to its readers, yet the revelation certainly didn’t tarnish Hepburn’s star status. One of Hollywood’s best loved actresses, the public continued to be dazzled by Hepburn’s charm. Many of the film’s audience had enjoyed seeing the story brought to life It was essential that the film captured the magic of the best loved stage production, as it had been such a success. Premiering on Broadway on March 15 1956, the production broke a record with 2,717 performances throughout its run at the Mark Hellinger Theatre, Broadhurst Theatre and then the Broadway Theatre. Showcasing the scale of the Broadway show’s success, the original cast recording became the best-selling album in the country in 1956. Taking the show across the globe, the theatre production’s original stars, including Julia Andrews and Stanley Holloway, later reprised their roles in 1958 at the Theatre Royal in London. And of course, interest surrounding the best loved musical certainly hasn’t faded over time. There have been a multitude of revivals over the years, with the Lincoln Center Theatre announcing plans for a Broadway revival of My Fair Lady in 2018. George Cukor was an American film director with a focus on literary adaptations and comedy. With that in mind, it’s no surprise that Cukor took on the challenge of the witty and wonderful My Fair Lady. Cukor directed classics such as Little Women (1933) along with the mesmerising film adaptation of Romeo and Juliet (1936).